MONICA MILEUR Mark Mantovani presses the flesh at the Webster Groves Community Parade. Councilwoman Hazel Erby calls Stenger "an equal-opportunity A-hole." Erby, who toggles effortlessly back and forth between being Stenger's most visible and vocal critic and Mantovani's staunchest supporter, personifies the dilemma facing St. Louis County voters. 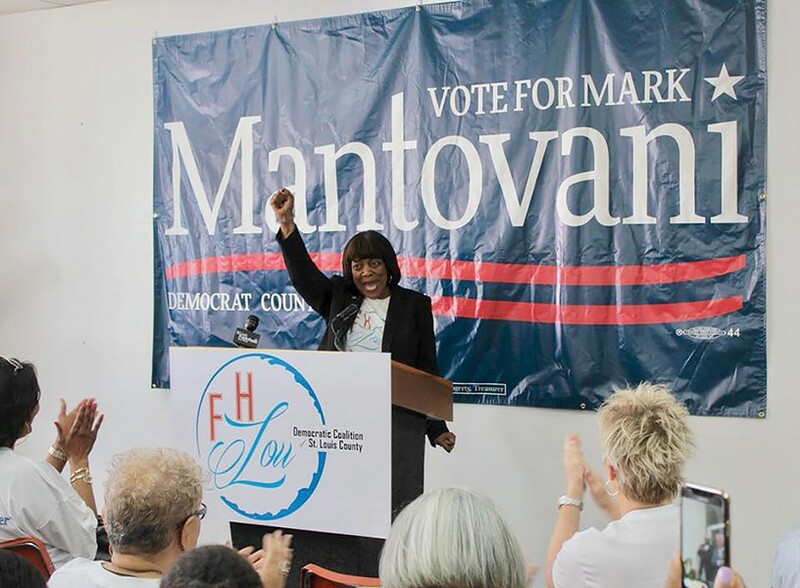 Are Mantovani's big, bold ideas enough to overcome his lack of elected experience in his quest to transform the region toward a brighter future? Or is he simply someone other than Stenger? One thing is certain: Erby is far from alone in her desire for a new executive. 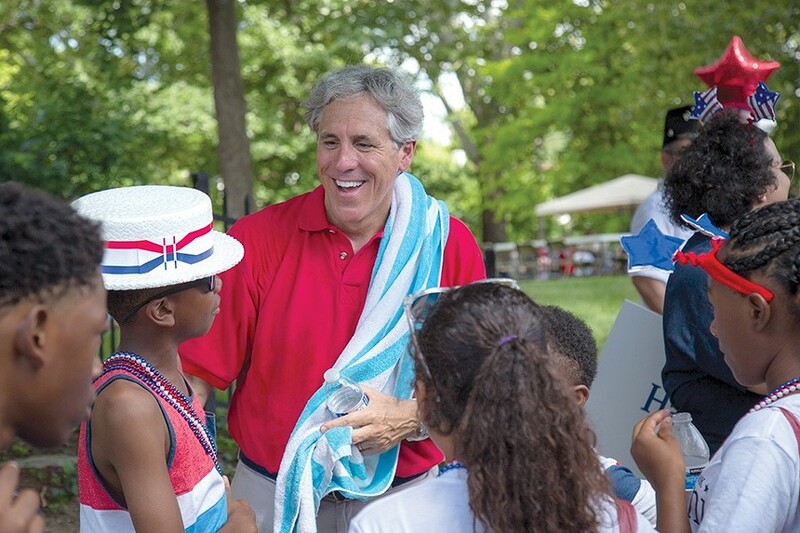 In April, led by Webster Groves Mayor Gerry Welch, nearly twenty elected officials, including the mayors of Cool Valley, Des Peres, Frontenac, Moline Acres, Pine Lawn and Rock Hill, threw their support behind Mantovani in an unusually public gesture. It's second nature for local leaders to trash-talk each other behind closed doors and off the record, but Stenger's adversaries express their desire to "get rid of the current dysfunction," as former Clayton Mayor Linda Goldstein put it, in front of cameras and microphones. 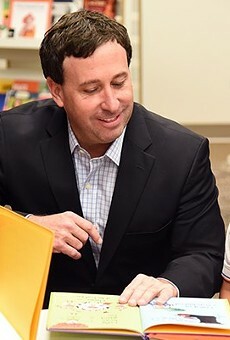 The concerns with Stenger expressed in April revolved for the most part around an inability — or unwillingness — to collaborate and a consistent lack of communication from the executive's office. But it's questions about ethics that seem to have the most tenacity. At the moment, Exhibit A in the case against Stenger's reelection is his handling of leases at Crossings at Northwest, formerly Northwest Plaza, in St. Ann. Robert and P. David Glarner are brothers, developers and, since Missouri's Amendment 2 does not apply to county or municipal candidates, major-league Stenger supporters — the $365,000 they've donated so far, in fact, is unprecedented in St. Louis County elections. While there's nothing hidden or "dark" about the donations, it's widely believed that the brothers' patronage fits tongue and groove with the twenty-year lease of nearly 150,000 square feet of redeveloped office space the county entered into at Crossings at Northwest, which the Glarners happen to own. The deal will cost the county between $69 and $77 million. Mantovani has pounced on it — who wouldn't? — referring to Crossings at Northwest as "the Glarner Mall." Mantovani has also said that if he's elected he will not accept any campaign contributions until the year of the next election arrives in 2022 and that he will never accept any money from any individual or organization doing business with the county. Others have questions about Stenger's wheelings and dealings as well. Missouri Attorney General Josh Hawley filed a lawsuit against the county executive's office, alleging violation of open-records law, and the St. Louis County Council, after reviewing a report prepared by its ethics commission, voted 5-0 to request state and federal law enforcement look into the Crossings at Northwest leases. Stenger is equally critical of contributions Mantovani has accepted. Mantovani, who ponied up $1 million of his own money to run, is his own largest donor. The vast majority of other contributions are $500 or less and are from individuals rather than the LLCs that have donated so voluminously to Stenger. There are notable exceptions, however. Dave Spence, a 2012 Republican candidate for Missouri governor and an unabashed advocate for right-to-work laws, contributed $5,000; longtime Republican George Herbert Walker, who served as ambassador to Hungary during the administration of his second cousin, George W. Bush, has contributed $11,000. While Stenger points to donations and contributions as evidence that Mantovani is not really a Democrat — a distinction he says is important when it comes to the more difficult parts of the county executive's job, such as balancing the budget — it's important to note that the Republican Party is not entirely absent from Stenger's list of donors, either. Stenger has accepted donations from former Missouri Governor and U.S. Senator Kit Bond and from Douglas Albrecht, chairman of the Bodley Group, who donated $160,800 to the Republican National Committee between 1991 and 2016.